Join us on July 25, 2019 to support Hospitality Homes for the 17th Annual Hospitality Homes Charity Golf Classic. bring her family to Boston for Noah’s care all the way from Upstate New York. opportunity to stay near their loved ones – regardless of their ability to pay. Every day we are reminded of the remarkable community built with your support. Strangers become family; families heal faster with their support network by their sides. The Patient Experience Symposium is a gathering of healthcare professionals, patient advocates, practitioners, educators, thought leaders, and patients who are transforming the patient experience, and changing the way people experience healthcare. Distinguished faculty provide insights as to what impact the patient experience has on both quality and economic improvements, what role leadership plays in creating the right culture for patient-centered care, and how to identify, evaluate and prioritize innovations that can quickly touch the lives of patients and practitioners. And, unlike other conferences on this topic, patients share their personal stories, providing a real-world perspective on patient experience. Our attendees leave invigorated and inspired, with new tools and strategies to make patient experience the best it can be! To learn more visit www.patientsymposium.com. Jodie Knutson remembers the first time her family arrived at the Brookline home of Pam and Harvey Lodish. Her two young sons, Ben and Josh, tore out of the house with Pam and Harvey's daughter, Stephanie, and ran down the street to the local playground. Strangers until that very moment, the families were instantly connected. Featured: Harvey and Pam Lodish and Ben and Jodie Knutson during one of their visits. "It was just like that, they kind of took us in and since then they have always been that second family to us," says Jodie. "My dad's an Iowa farmer and I think he said it best. He said to Pam, 'you're the nicest strangers I've ever met.'" "I still remember all those years ago, we took an Angel Flight to Boston and within five minutes, the doctors were able to answer questions about Ben's health that we had had for the first two years of his life," says Jodie. "Boston is where Ben's team is. We trust them. We wouldn't go anywhere else." Ben was diagnosed with Klippel-Trenaunay Syndrome (KTS), a rare congenital vascular disorder associated with the overgrowth of blood vessels, soft tissue and bones of one limb, most often the leg, though in Ben's case it affected his left arm and torso causing a great deal of pain and reduced movement. "When you're away from home and your own support system, you're lost, you really don't have any idea what you're doing. You just fly by the seat of your pants and hope you make the right decisions," said Jodie. "Pam and Harvey have opened their hearts and their home to us. They've always been there to say, 'how's it going today?' or to help us get our minds thinking about an upcoming appointment, or to offer a ride when it's raining. No matter when, they've said if you need us, give us a call." Pam said, "Jodie is right, she and her husband Steve, and her sons, Josh and Ben are a part of our family. We have watched their dedication to helping Ben find the best care for his medical situation. And helping families, such as the Knutsons, has helped us teach our children, and now our grandchildren, a valuable life lesson - that reaching out and helping families from afar, is not that big a deal and really doesn't take much work - just a clean room and a house key, plus some basic clues about how to get back and forth to the hospital." This year's trip to Boston was once again for surgery. After years of doing everything possible to save his left arm, Ben agreed with his medical team that it was time to amputate. "It's something that my doctors have been talking about since I was little," said Ben. "It became clear to me that things would only continue to get worse, so amputation was the right choice." "Ben has been incredibly courageous and patient with this malformation, which has caused excruciating pain. He has endured enough pain and discomfort for several lifetimes," said Upton. "What a kid!" "It's always hard to put into words what we've gone through," said Jodie. "We've had something that has totally changed everybody's lives in our family, but we're blessed with the people we have come in contact with at this hospital and in this community. After Ben was discharged, he and his mom spent one more night with Pam and Harvey in Brookline before heading back to Iowa. As thankful as he continues to be for Pam and Harvey's gracious hospitality, Ben was more excited to be going home. There was a slow pitch softball competition he was hoping to attend, and he said, he could use a little quiet time away from the city crowds. "Yeah, it's been a long three weeks." Ben is now 28. Over the past 27 years he and his family have traveled multiple times to receive specialty care at Boston hospitals, starting as a toddler at Boston Children's Hospital and since Ben's teen years, under the care of Dr. Joseph Upton, a plastic surgeon at Beth Israel Deaconess Medical Center. 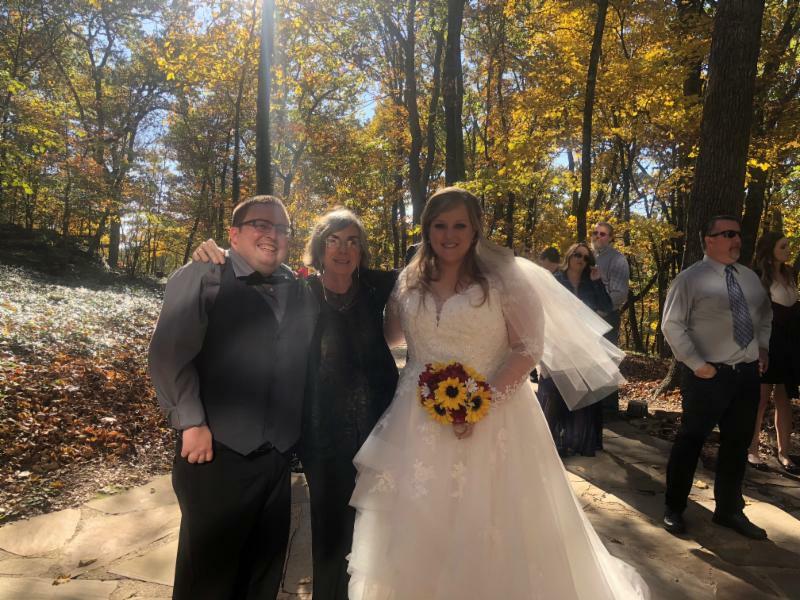 In October of last year, Pam Lodish and her daughter Stephanie traveled to Eureka Springs, Arkansas to witness the marriage of Ben Knutson and Kellie Robbins. Now through December 31, we are asking the public to provide gift cards - or donations to get gift cards - for our guests. Gifts of any amount will help and are deeply appreciated, but we do our best to make sure the average gift is $25 per family. What gift cards should I get? In Denominations of $10 or $25 to Au Bon Pain, Starbucks, Dunkin, Whole Foods or Star Market, are all great choices! 2. Mail a check with “Filled With Love” on the memo line to the address above. Gerald Schuster, founder of Continental Wingate Co. Inc., prominent businessman, philanthropist, and longtime supporter of numerous local and national Democrats on the state and national stage, passed away recently at the age of 89 at his home in Boston, surrounded by his loving family. Mr. Schuster, known to all as “Jerry,” led a full life dedicated to his family, his businesses, philanthropy, and political activism across the country. Mr. Schuster’s commitment to giving back to his community is especially visible throughout the Boston area. He and Mrs. Schuster were longstanding supporters of the Brigham and Women’s Hospital, Massachusetts General Hospital, and Dana-Farber Cancer Institute. Mr. Schuster helped establish the Hospitality Homes apartment program and for over 20 years this program has provided free medical housing for thousands of families and their loved ones who are receiving medical care in the Boston area. All of us at Hospitality Homes are grateful for the support of Gerald Schuster, his family and the many wonderful people of Wingate who have had a lasting impact. “We were 800 miles from home facing two weeks’ recuperation from two surgeries at BWH/DFCI before the final procedure could be performed. Our hearts sank…where could we stay? Through your thoughtful generosity and compassion for those far from home, my husband was able to regain his strength and fortify his determination for the final surgery. We sincerely Thank You for donating this apartment to Hospitality Homes. We consider you, Mr. Schuster, to be part of our healing team of caring human beings that helped us through this medical journey. With much gratitude and warmest regards, S&D, Michigan"
Boston, MA - February 2, 2018. Hospitality Homes announced today they are the recipient of a 2-year grant of $38,000 from the Maine Cancer Foundation. With the funding, Hospitality Homes will work to increase various housing and transportation services to Maine cancer patients who need to travel to Boston medical centers for cancer care and follow up support. The focus of the project is to increase the number of Maine cancer patients served. Through this targeted effort, Maine cancer patients will have access to housing and transportation services, provided at little or no cost while in Boston, whether it is for active cancer treatment, follow up appointments/screenings and/ or accessing cancer survivor support. The housing and transportation services are available to both pediatric and adult Maine cancer patients and their support team. Every year, Maine residents have to travel to seek the best in medical care in Boston. With an average hotel room rate of $257.00 per night, finding an affordable place to stay looms especially large in Boston. The Board of Directors of Hospitality Homes is pleased to announce the appointment of Marianne M. Jones as the organization’s new executive director. Jones, who recently served as the president of the Women’s Fund of NH/NH Women’s Foundation, brings over 15 years of leadership and management experience with New England-area foundations and non-profits to her role at Hospitality Homes. Since 1983, Hospitality Homes has provided free housing in volunteer host homes for family and friends of patients receiving medical treatment in the Boston area, regardless of income, nationality, or the patient’s age, diagnosis, or treatment facility. Thousands of patients travel to Boston each year to receive medical treatment, accompanied by supportive family and friends. As a result of an acute medical crisis, many arrive in an unfamiliar city with no place to stay or lack the financial resources for lengthy hotel accommodations. “Having spent nights in the ICU with a critically ill infant and anxious hours in hospital waiting rooms in an unfamiliar city, I understand first-hand the intense needs and isolation of families supporting loved ones through medical crises or serious procedures. Hospitality Homes provides an incredible, compassionate service for an ever increasing need for temporary housing during medical treatment in Boston,” explains Jones. Hospitality Homes reaches out to the community and graciously asks volunteer hosts to open their doors and their hearts to people who are coming to Boston at a critical time in their lives for medical treatment. Families interested in being a volunteer host and participating in the program are asked to provide a spare room and access to a bathroom. Prior to hosting, all volunteer hosts attend a training session and have a Hospitality Homes staff member visit with the host at their home. For more information, review frequently asked questions and/or benefits of becoming a Hospitality Homes Host, please visit www.hosp.org. Hospitality Homes is a non-profit organization that provides no-cost housing through volunteer host homes for family and friends of patients receiving medical treatment in the Boston area, regardless of income, nationality, or the patient’s age, diagnosis, or treatment facility. Recognized by the New England Patriots in 2014, Hospitality Homes received the Myra Kraft Community MVP Award for exceptional volunteerism. Since 1983, Hospitality Homes’ unique, home-away-from-home lodging option has provided a caring response as well as relief from emotional and financial challenges for these individuals and families. Hospitality Homes’ current host home network includes nearly 70 active volunteers throughout the Boston area.